Our unique Golf Schools enable Gary and the team to build you an improvement plan for the rest of your golfing life. The Schools are based on the Gold Coast and include instruction for a maximum of 6 people. We use the latest technology to show you how to build an efficient, powerful and repeatable golf swing. 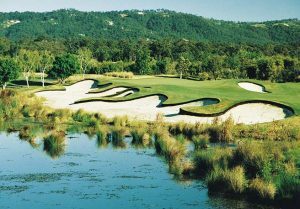 Both courses we play in the 3-Day School were Designed by champion Australian golfing icon, Greg Norman and are typical of his trademark aggressive layouts offering golfers a challenging round of golf, visually stunning surrounds. Gary does the hard work on Day one, analysing your swing, building you a swing model and giving you the information that is key to improvement. With a 1 to 2 Instructor-student ratio and the finest practice and training facilities, our Golf Schools are the best way to learn the simple principles that all our players use to get power and consistency. It is not all work, though. We encourage students to take their time on the course, with 18 holes planned each day, implementing the principles they have learnt with the help of our Instructors on two of the best Golf Courses in Queensland. Unfortunately we only have a limited number of these schools available in 2019 so booking well in advance is the only way to secure your Golf School.